CATIA and SOLIDWORKS are from the same company DASSAULT SYSTEMS. It is a FRENCH multinational software company. That develops the 3D design, 3D Digital mock-up, and PLM (product lifecycle managements) software. CATIA is a giant and an all in one package entirely on different scale. Both the software are playing crucial role in their own place, so it is insignificant to compare with each other. SolidWorks is more user friendly and easier user interface than CATIA. 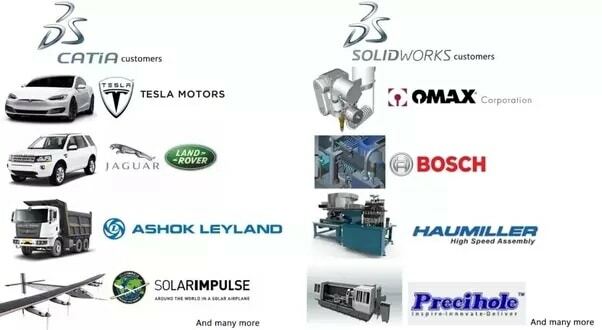 SolidWorks is used for Design, Electrical, and Mechanical streams except for the Architectural designs. CATIA do not have Advanced Surfacing features. SolidWorks is rich in Advanced Surfacing features that can create mid surfaces, planar surfaces, extend, freeform-radiated surface, Min Radius Analysis, Surface Fill, Swept, Symmetry Check Analysis, Trim, Undercut Analysis, and much more. CATIA lacks Sheet Metal Design Features such as Forming Tools, Bend Lines, Toggle Flat Display, and Hole Tables. All the Sheet Metal Design Features are present. Readable files supported are ASCII, DXF, and IGES only. Readable files supported ACIS, ASM, BMP, DRW, DWG, and much more except ASCII. Licensing stars from $25,000. Licensing starts from $6000. Catia is the one for large projects. Solidworks is more aimed at smaller projects, smaller companies, this kind of things. That shows in the way their PLM works.